On Labor Day weekend, my wife’s best friends from New Jersey came and visit. On Friday we took them to Kinston for lunch (at Boiling Room) and to visit the Neuse Sport Shop on U.S. RT. 70. They pass it on the way to New Bern and wanted to check out the fishing gear. We also took our pictures at the “Chef n Farmer” across from the CSS Neuse. The CSS Neuse was one of 26 ironclads commissioned by the Confederate navy. Having a wide, flat bottom, the vessel resembled a river barge. When completed, the twin-screw steamer was plated with iron armor and measured 158 feet long and 34 feet wide. They turned my wife onto oysters. We also showed them the sites around New Bern and Oriental, NC before having dinner in Oriental at M&M. Firing of the 32 pound cannon. On Saturday, we took them to Morehead City and Beaufort. Art is a serious anglers. He own as 28 foot “Carolina Classic” make in U.SA. in North Carolina. Art enjoyed looking at the other fishing boat (Charter fishing boats) in the harbor. While we were in Morehead City, we stop at Altantic Beach and visit Fort Macon. On Saturday at 1330, the National Park Service were firing off the 32 pound cannon. They showed us the 32 pound shell. The shell would travel a little less than a mile. It takes four men to operate the cannon. It was impressive. On Sunday, Michele friend travel back to New Jersey. 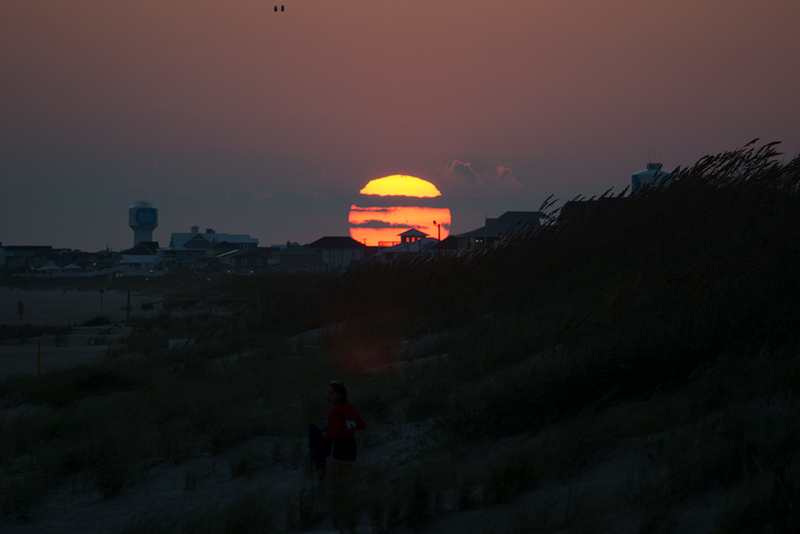 Michele and I went back to Fort Macon for sunset picture.